Pottery for kintsugi art therapy, held by Heidi Herring. “You use gold, and you accentuate where the creases are,” Herring says. “What it means is there’s strength in life experiences, and you’re strong through your brokenness. And through being able to piece yourself back together.” Photo by Sammy Feldblum. This is the second story in a six-part series on mental health and drug abuse in Columbus County. Today, writer Sammy Feldblum examines the conjunction of mental health issues with overprescribed opioids and opioid addiction, the biggest health crisis in the nation. On Thursday, Part III will examine how law enforcement picks up the slack of the behavioral health care shortfalls. More opioids are prescribed in Columbus County than anywhere else in North Carolina. In a county opioid forum at Southeastern Community College on November 8, Lt. Steven Worthington of the sheriff’s narcotics division fixed a number to that statistic: 141 pills per person per year. And that is only through legal medical channels—heroin looms as a cheaper fix when prescription medications become unavailable or not strong enough. This series is examining mental health care in North Carolina, a story in which opioids play an enormous role. Last week, the News Reporter and Scalawag looked at changes in the state mental health care system in the latter half of the last century and beginning of this one, when deinstitutionalization left more psychiatric patients back in their home communities, and an underfunded state privatization effort left those patients often without adequate care. For many North Carolinians, plentiful opioids rushed in to pick up the slack. Around the same time as the privatization movement was heating up, pharmaceutical companies were making a push at the end of the last century to market newly developed pain medications. Before then, fears of the addictive potential of opioids left doctors skittish to prescribe them. Opioids—drugs derived from the opium poppy plant and synthetic copycats—bind to opioid receptors in the brain, relieving painful sensations and typically producing feelings of euphoria. In 1995, Purdue Pharma released OxyContin, a powerful and long-lasting painkiller, and rolled out a marketing campaign meant to convince doctors that fears of its addictive properties were unfounded. The company funded studies and paid doctors to publicize that message, and the medical culture around opioids changed, as doctors began using the drugs to treat a wider variety of complaints. But their assurance that opioid painkillers were not addictive was a lie. The breezier attitude toward opioid prescription is directly connected to the ongoing national crisis, which has claimed the lives of more than 200,000 Americans in the last 20 years. As more and more patients were being prescribed the painkillers, mental health provisions were fading in North Carolina. Without access to effective mental health care, more and more people facing psychiatric disorders turned to opioid pills for imperfect relief. Research published in the Journal of the American Medical Association has found that 47 percent of users seeking treatment also have psychiatric disorders, particularly personality and mood disorders like depression and bipolar. Those with mental health issues, in turn, had more severe substance problems than those without. In Columbus County, it’s common knowledge which doctors patients can turn to for easy access to the drugs. And with a severe shortage of practitioners able to prescribe psychiatric medications and adequate mental health care, those clinics offer a seductive alternative. Patients need not have a mental health issue to become addicted, however. Some get there through experimentation. Some get there through a hazy combination of the two, tumultuous life circumstances and fast living feeding one another. For those who do develop substance use disorder, its gravity pulls in the people around them, scattering trauma outward. One man in Whiteville contacted the News Reporter and Scalawag to share his story. The News Reporter and Scalawag are using pseudonyms to protect the identities of those involved in the story. When he was 18 years old and still in high school, Jeremy fell in love and got married. Within a year, he and his wife, a classmate, had a daughter, Kathryn. Jeremy was untroubled by his youth—he was working in a textile mill in those days, making enough to support a child even as he was going to school full-time. “To be fair,” he adds, “she was probably being a typical 18-year-old at the time.” The two eventually split up, leaving him to take care of their baby. After a year, though, Jeremy’s ex took custody of their daughter. For years, he saw Kathryn every other weekend. When she was in middle school, Kathryn let on to him that her mom would coach her to go to the doctor and complain about pain. Kathryn’s mother “used her as a tool to get more painkillers,” Jeremy says. By eighth grade, Kathryn had missed more than 180 days of school, the equivalent of an entire year. She fell in love with an older boy, and Jeremy found notes she had scribbled admitting dreams of getting pregnant. Soon, she was. She had a baby in her mid-teens, and in his early 30s, Jeremy became a grandfather. Kathryn’s daughter, Blanca, stayed with her relatives on her grandmother’s side. Kathryn “was not going to school, not doing anything, just existing,” Jeremy says. Within three years, Kathryn was pregnant again. This time, when it came time to deliver, something was amiss. The doctors were stopping Kathryn’s labor, leaving her confused and upset. “That was the moment that I realized that we went to nuclear versions of drug abuse here. I did not understand how badly things had deteriorated,” he says. Within a couple of years, Kathryn’s boyfriend, the father of her second child, was locked up on drug charges. At that point, Jeremy remembers, “she lost her supply of drugs,” and spiraled. Jeremy checked her into a detox program in Lumberton, thirty minutes northwest. But she was over 18 now. “And this is the problem, when you have a girl, especially a half-way pretty girl,” Jeremy says. “The drug dealers go get her. They need her to work. So they go and get her out. It’s not jail. She can walk out of any facility.” This would happen again, more than once. He took her to a 30-day facility four hours away. Same result: This time checked out by her grandmother. Jeremy took her back in for what he called “daddy rehab.” “I kept her with me every moment,” he says. Within a few months, that strategy ended when she tipped off friends about the family’s schedule, and they broke in and stole Jeremy’s wife’s jewelry. Jeremy did not see Kathryn for a few months. The next time he did, she had been living in “a drughouse—a whorehouse,” says Jeremy. She had been dropped at the hospital to get more drugs, and he found her wandering beside the highway, dazed and frail, less than a hundred pounds, blood spattered on her clothes. More rehabs failed. Kathryn contracted hepatitis C and got pregnant again. This time, the father’s identity was a mystery. Her third child, a boy, was born addicted to opioids, his lungs underdeveloped, and spent his first few days of life going through withdrawals in the hospital. All three children eventually found stable homes. Kathryn’s son, born dependent on opioids, is now healthy. Kathryn tried rehab in Florida, but found her way back to a fix, and is again living in Columbus County. In 2015, 1,483 North Carolinians died of drug overdoses, more than four every day, according to the state Department of Health and Human Services. The vast majority of those overdoses were from opioids, legal and illegal. In June 2016, the state passed legislation allowing pharmacies statewide to make naloxone available without a prescription. Naloxone, a nasal spray that commonly goes by the brand name Narcan, reverses the symptoms of opioid use, and can save the life of someone experiencing an overdose. Doses of Naloxone, a drug that can reverse the effects of an opioid overdose. Photo by Callaghan O'Hare. In June of this year, North Carolina took a more direct step with the Strengthen Opioid Misuse Prevention (STOP) Act. The bill limits the pill count and length of opioid prescriptions for patients after acute injuries and after surgeries, and it requires prescribers to consult the state Controlled Substances Reporting System before prescribing the pills. A study this year by the Centers for Disease Control put the pills’ addictive qualities in perspective, especially when they are prescribed in longer courses. Of patients given prescriptions of eight or more days, 13.5 percent were still using opiates a year later. For patients prescribed a month of the medications, that rate spiked to 30 percent. But shortening prescriptions, and even locking up “candyman” doctors, will not solve the county’s opioid problem. In populations with substance use disorder, when prescription medications are unavailable, heroin use often rises to meet the need. Heroin, both more powerful than its medical cousins and less regulated, comes with a higher risk of overdose and death. To help those struggling with dependence, practitioners of “medication assisted therapy” administer courses of methadone and suboxone, two drugs that bond to the same receptors as more powerful opioids without the same psychotropic effect. They can help substance users taper off by reducing withdrawal symptoms, and without giving the same high as more powerful drugs. Even these drugs come with risks: both can provide a milder high, so are themselves potentially subject to abuse. There are cases of methadone overdose, which can be deadly, as well as suboxone overdose, which is rarer and unlikely to be fatal—suboxone includes naloxone, the drug that reverses symptoms of opioid overdose. But both have been shown to substantially reduce mortality risk in people dependent on opioids, in some studies by up to 70 percent. Methadone and suboxone clinics try to use innovative strategies to ensure people are taking the medicines as prescribed. Whiteville Pain & Spine, with whom Herring collaborates, provides patients suboxone in the form of a strip. Each week, Herring says, patients must bring back the peeled strips to get next week’s prescription. Differences in individual style aside, many patients have trouble even accessing care, whether because of lack of insurance, lack of transportation, or lack of knowledge where to go. Faith-based organizations in Columbus County have tried to pick up the slack, and offer some of the most accessible support for people in the county. Janet McPherson is executive director of Living Hope Pregnancy Support Services, a ministry that counsels women through their pregnancies and early motherhood without charge. Over the two decades that she has been with the program, McPherson has seen the scope of her work change dramatically. Living Hope did not plan to focus on helping expecting mothers navigate opioid use during pregnancy, but it is “something that has just fallen into our lap, because of the need,” McPherson says. People are more aware of what happens in their church, however, and many recovery programs are housed there. Darren Mills runs a chapter of Celebrate Recovery at Living Word church in Chadbourn, a town west of Whiteville. He gave directions to come meet him at Living Word after crossing into town and seeing the church being built on the right. It was only when I hit a third church down the block that I knew I had gone too far. Mills speaks openly about his decades of addiction, which have left him with a firmer take on substance abuse than some of his fellow-travelers. When abusers do hit bottom—if, of course, they survive that bottom—Mills finds that a pious life helps them to stay on the straight and narrow. Among other things, what faith can offer is something that seems in short supply in certain corners of Columbus County: hope. Heidi Herring. Photo by author. Dealing with substance abuse, then, means treating more than just the substance abuse. “It does no good just to stop the flow of medicine and think people are going to recover by themselves,” says Rep. Murphy. “So where I think the biggest focus actually needs to be moving forward is mental health and substance abuse counseling and treatment.” Alongside the STOP Act, state legislators earmarked $10 million in funding over the next two years for just those purposes. 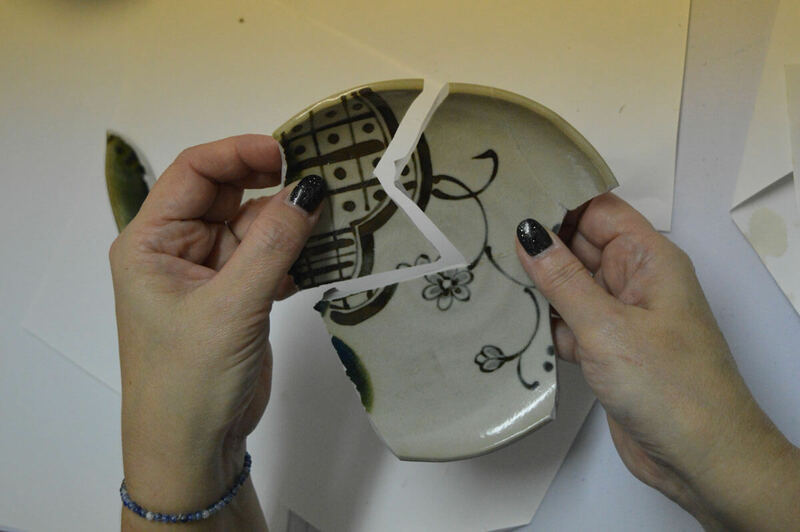 In her office, Herring shows off some shards of Kintsugi, a Japanese technique of reassembling broken pottery that she uses in art-based therapy. In the reassembly process, the patient accentuates the seams of the ceramics with gold paint. “In reality, they use real gold, but we’re not. We use gold color,” she laughs. Behavioral health shortages force many with urgent mental health crises into hospital emergency rooms lacking effective treatment options.